The Grand Prix of Czech Republic saw Rockstar Energy Suzuki World MXGP’s Clement Desalle scale the podium with third position at a hard and slick Loket circuit flanked by 24,000 spectators. Team-mate Kevin Strijbos managed fourth overall on the factory RM-Z450 in what were sunny and temperate conditions at the scenic course close to the Spa town of Karlovy Vary. The works crew headed to the notoriously-tricky track with both Strijbos and Desalle in action and with the latter boasting a decent record at the venue with six podiums and three victories in his last six appearances. Desalle was, however, not fully fit and just finding his way back to race speed after his recent knee problem. Strijbos experimented with suspension settings on Saturday while Desalle made a bright start but did not want to take any risks during the qualification heat on what was a dusty and sketchy surface. The soil was rougher on Sunday and the starts – once more – so crucial around the narrow and winding layout. 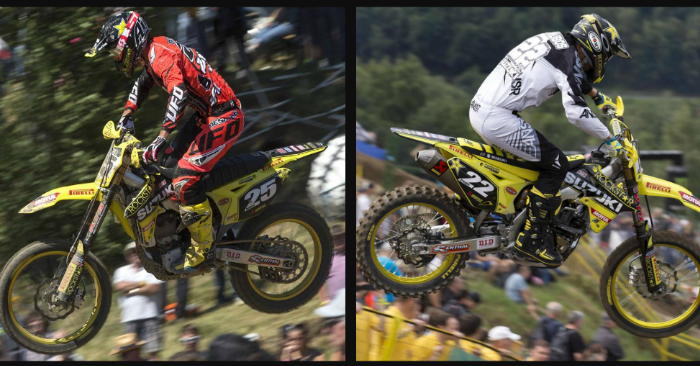 In the first race Desalle made the better launch and hovered in fourth position behind the escaping Gautier Paulin. He had Jeremy Van Horebeek in close proximity the whole moto with Strijbos drawing-up to form a trio disputing the final slots in the top-five. The gaps between the riders fluctuated and they all shifted-up a place when Paulin crashed down to seventh. Desalle finally crossed the line with a pleasing third and Strijbos took fifth. The second race was again graced with some sunshine and the Loket dirt was in its roughest state all weekend. Desalle aced the holeshot and held-off Evgeny Bobryshev and had a fun brief battle with Romain Febvre. The ‘#25’ could not contain the Frenchman or the Russian but a 3-3 meant a seventh podium finish of the season. Strijbos was circulating at a similar speed and was between three-four seconds behind his team-mate in fourth. In the World Championship picture Strijbos is 10th and Desalle has put some points back on the board to remain sixth after missing the last three rounds through injury. Rockstar Energy Suzuki World MXGP head into very familiar terrain next weekend with the Grand Prix of Belgium set to be staged in the sand of Lommel. The team is based only a few kilometres from the circuit and use the punishing terrain for testing on a regular basis. MXGP Moto1: 1. Romain Febvre (FRA, Yamaha), 35:06.583; 2. Evgeny Bobryshev (RUS, Honda), +0:09.363; 3. Clement Desalle (BEL, Rockstar Energy Suzuki), +0:12.260; 4. Jeremy Van Horebeek (BEL, Yamaha), +0:13.651; 5. Kevin Strijbos (BEL, Rockstar Energy Suzuki), +0:14.952; 6. Shaun Simpson (GBR, KTM), +0:32.926; 7. Gautier Paulin (FRA, Honda), +0:35.421; 8. Glenn Coldenhoff (NED, Rockstar Energy Suzuki), +0:37.532; 9. Tommy Searle (GBR, KTM), +0:42.624; 10. Nathan Watson (GBR, Husqvarna), +0:47.118. MXGP Moto2: 1. Romain Febvre (FRA, Yamaha), 35:24.379; 2. Evgeny Bobryshev (RUS, Honda), +0:05.230; 3. Clement Desalle (BEL, Rockstar Energy Suzuki), +0:07.968; 4. Kevin Strijbos (BEL, Rockstar Energy Suzuki), +0:10.308; 5. Jeremy Van Horebeek (BEL, Yamaha), +0:15.326; 6. Shaun Simpson (GBR, KTM), +0:21.997; 7. Gautier Paulin (FRA, Honda), +0:31.230; 8. Tyla Rattray (RSA, Kawasaki), +0:34.031; 9. Davide Guarneri (ITA, TM), +0:36.966; 10. Nathan Watson (GBR, Husqvarna), +0:44.246. 11. Glenn Coldenhoff (NED, Rockstar Energy Suzuki), +1:03.984. MXGP Overall result: 1. Romain Febvre (FRA, YAM), 50 points; 2. Evgeny Bobryshev (RUS, HON), 44 p.; 3. Clement Desalle (BEL, Rockstar Energy Suzuki), 40 p.; 4. Kevin Strijbos (BEL, Rockstar Energy Suzuki), 34 p.; 5. Jeremy Van Horebeek (BEL, YAM), 34 p.; 6. Shaun Simpson (GBR, KTM), 30 p.; 7. Gautier Paulin (FRA, HON), 28 p.; 8. Glenn Coldenhoff (NED, Rockstar Energy Suzuki), 23 p.; 9. Tyla Rattray (RSA, KAW), 22 p.; 10. Nathan Watson (GBR, HUS), 22 p.
MXGP World Championship Standings (after 13 of 18 rounds): 1. Romain Febvre (FRA, YAM), 507 points; 2. Gautier Paulin (FRA, HON), 419 p.; 3. Antonio Cairoli (ITA, KTM), 416 p.; 4. Evgeny Bobryshev (RUS, HON), 389 p.; 5. Maximilian Nagl (GER, HUS), 360 p.; 6. Clement Desalle (BEL, Rockstar Energy Suzuki), 331 p.; 7. Shaun Simpson (GBR, KTM), 306 p.; 8. Jeremy Van Horebeek (BEL, YAM), 294 p.; 9. Glenn Coldenhoff (NED, Rockstar Energy Suzuki), 266 p.; 10. Kevin Strijbos (BEL, Rockstar Energy Suzuki), 257 p.